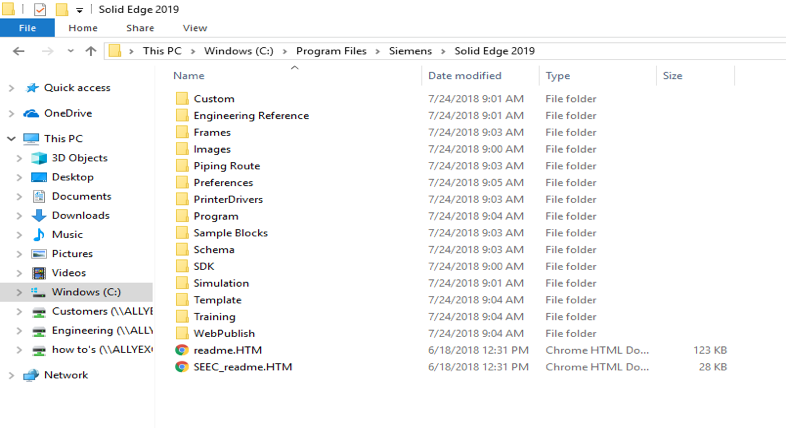 The Solid Edge Application is now installed in a Siemens directory inside of your program files; below is a screenshot of the folder structure and location. As you can see, the folder structure hasn’t changed from previous versions, other than being stored in the new Siemens folder. You will still find items like your license, materials, holes and options.xml in the preferences folder. The default templates will still be found in the template folder along with your customized reports. The other file locations for Solid Edge, such as the files stored in the users appdata and registry, have also been changed. In versions prior to Solid Edge 2019, they both were stored in a Unigraphics Solutions folder. This directory has been renamed Siemens. These new file paths are listed below.